SSPC-SP 10 near-white metal blast cleaning (NACE No. 2) is a standard used for near-white metal blast cleaning put forth by the Society for Protective Coatings (SSPC) and NACE International Standard. Near-white metal blast cleaning is to be used to clean unpainted or painted steel surfaces prior to applying a new protective coating or lining systems. SSPC-SP 10/NACE No. 2 removes all dust, coating, and mill scale. The limit of staining permitted for near-white metal blast cleaning is no more than five percent of each unit area of the surface. When is SSPC-SP 10 Near-White Metal Blast Cleaning Used? SSPC-SP 10/NACE No. 2 near-white metal blast cleaning was created because some atmospheres which were being exposed to harsh conditions were costing too much to apply SSPC-SP 5/NACE No. 1 white metal cleaning for removal of all streaks and shadowing. Also, commercial blast cleaning, SSPC-SP 6/NACE No. 3 was not high enough to a degree of cleanliness to accomplish the cleaning required for a new protective coating or lining system. Therefore, SSPC-SP 10/NACE No. 2 was created to lower costs for service preparation and intended to use in areas exposed to high humidity, chemical atmospheres, marine and other corrosive environments. What is needed before SSPC-SP 10/NACE No. 2? As mentioned above, SSPC-SP 10 near-white metal blast cleaning has a limit of staining of no more than five percent of each unit area of the surface. This means light shadows, slight streaks, or minor discolorations remaining from contamination are permitted after SSPC-SP 10/NACE No. 2 is performed. Note that any variation on the surface caused by the original steel conditions do not factor in the no more than five percent of each unit area of the surface that can have the staining. The unit area that is evaluated should always remain approximately 5776 SQ mm or 9 SQ in to best meet the allowed percent of cleanliness per each unit area of the surface. For SSPC-SP 10 near-white metal blast cleaning (NACE No. 2) the surface must be clear of any visible deposits of contaminants, which should be removed in accordance to SSPC-SP 1 (Solvent Cleaning). Some coating specification might require a chloride test being performed to make sure the deposited soluble salt amount is less than the permissible limit. If after solvent cleaning still, the soluble salt content is higher than allowable limit, then specification might call for high-pressure water jetting. Prior to applying the new specified coating system. The coating specification requires that the surface has the correct roughness after applying SSPC-SP 10/NACE No. 2 for the new coating system. Substrate temperature should not be colder surrounding air temperature; otherwise, the moisture can condensate on the cleaned-blast surface and cause flash rust. Relative humidity should be less than 85% since the higher value can cause moisture condensation on the surface. The sandblasting process should not be done if the surface temperature is less than 5-degree Fahrenheit(or 3-degree Celsius) above the dew point. The dew point is the temperature that condensation starts. In addition, all conditions mentioned in the coating specification must be met for near-white blast cleaning. The coating specification documents are part of the contract and have established requirements that must be met per project. What Methods can be used for SSPC-SP 10/NACE No. 2 near-white blast cleaning? Using a closed-cycle, recirculating system with compressed air, blast nozzle, and an abrasive, with or without vacuum for recovery of abrasives and dust. Using a closed-cycle, recirculating system with centrifugal wheels and an abrasive. Additional methods can be discussed between the contractor and those who established the requirements. What Abrasives can be used for SSPC-SP 10 Near-White Metal Blast Cleaning? Abrasives are used for grinding, polishing, or cleaning hard surfaces. SSPC-SP 10/NACE No. 2 calls for the use of abrasives in the methods listed. The abrasives selected for this method depend on a variety of factors. In order to select an appropriate abrasive, the type, grade, and surface condition of the steel need to be considered. The size and type of abrasive should be selected based on the blast cleaning system to be used, the surface that requires SSPC-SP 10/NACE No. 2, the finished requirements of the surface, and if recycling of the abrasive is necessary. 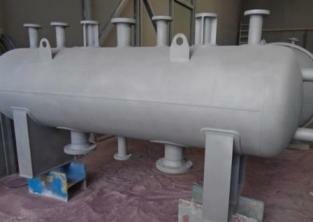 The abrasive used for near-white blast cleaning should be dry and free of any contaminants, such as oil, grease, etc. The air compressor alsoo should be checked for oil and water contamination by Blotter Test. What Happens after Near-White Blast Cleaning? Once the methods above have been applied, be sure to remove all visible residues from the surface. This can be achieved with the use of brushing, blowing off residue with clean, dry air, and vacuum cleaning. All dust (the product of sandblasting process) should be removed from the substrate by the stream of air blow (almost 90 psi). Some specification require a Surface Dust Test to make sure all dust being removed from the surface. Most coating specification requires a surface profile measurement by press-o-film (replica film test) or commercial name as testex tape test. The referenced standard for performing this test is ASTM-4417, method C or ISO-8503-1. The amount of surface profile depends on coating specification, but most of the specifications require 2 thru 3 mils. As mentioned prior, after blast cleaning, be sure to meet all surface standards as presented in the job coating specification. Unperfected surfaces may lead to premature paint failure. In addition, prior to continuing with the coating, be sure to remove any visible rust that forms on the steel surface after blast cleaning. If the recently blasted surface is exposed to salts, moisture, contamination or a corrosive environment, rust can occur quickly. Therefore, always be certain to remove visible rust prior to continuing with the new coating system. As with all standards, it is very important to take the necessary precautions when working with blast cleaning.